UNCASVILLE, Conn., Aug. 27 – The Shock have never been shy about their confidence as a basketball team and Sunday night they backed up their bravado with a stunning 24-point victory over Connecticut, 79-55, to win the Eastern Conference finals, 2-1. Less than 24 hours after going a combined 3-for-20 from the floor in game two, Shock guards Swin Cash and Katie Smith came out with a vengeance with 16 points each. Cash had five of Detroit’s first eight field goals and 12 points in the first half while Smith had nine points as the Shock built an early 11-point lead. The Shock cemented the game in the third quarter. Before Connecticut would score a point, they missed five shots and turned the ball over five times. By that time, the Shock had scored eight points, taken a 15-point lead and collectively broken the will of the Sun, who captured the Eastern Conference title in 2004 and 2005. Connecticut shot just 30 percent from the floor and sank 6-of-25 from three-point range. They were just 7-of-10 from the foul line. A day earlier, Connecticut was 25-of-29 from the foul line in a game two victory. Sunday night, Detroit had 42 points in the paint, 22 second-chance points and 12 points on the fast break. Connecticut had just 16 points in the paint and no points on the fast break. For Detroit, it was their biggest win ever over the Sun. For Connecticut, it was the second-worst playoff loss in team history. In 2000, the Orlando Miracle lost to Cleveland by 29 points. The Shock will face defending champion Sacramento in the WNBA finals beginning Wednesday in Detroit. Where do the Sun go from here? They’ve had the best record in the league for the past two seasons. A year ago, they lost to Sacramento in the WNBA finals. This year, Nykesha Sales missed 12 games and never recovered offensively. Katie Douglas played the final two games of this series with a broken bone in her foot. Taj McWilliams-Franklin will be 36 in October. Decisive game 3 is Sunday at 8 p.m.
UNCASVILLE, Conn., Aug. 26 – Unlike the Knicks’ Willis Reed, who famously limped onto the floor at Madison Square Garden with a torn muscle in his right thigh to spark New York to a Game 7 victory over the Lakers in 1970 NBA finals, Katie Douglas didn’t limp onto the Mohegan Sun Arena floor Saturday night. Playing with a broken bone in her right foot suffered at the end of Connecticut’s game 2 win over Washington a week ago, Douglas ran onto the floor and started the game. It wasn’t full speed but it was enough. Douglas scored six points, including a big three-point shot over Swin Cash in the Sun’s huge third quarter run as Connecticut remained alive in the Eastern Conference finals with a 77-68 victory over the Detroit Shock to tie the best-of-3 series at 1-1. Game 3 is Sunday at 8 p.m. with the winner going to the WNBA finals. “I didn’t want to distract (my teammates) but I wanted to give them something if I could,” Douglas said. Simply being on the court helped create space for her Sun teammates. Douglas didn’t take a shot in the first half but had two assists. Nykesha Sales, who had made just two field goals in her previous three playoff games, had three first-half field goals and finished with 15 points. Taj McWilliams-Franklin had 18 points while 7-foot-2 Margo Dydek had a playoff-career high 17 points as Connecticut beat Detroit for the first time in five games this year, snapping a four-game losing streak against the Shock. “I’m just proud of how we bounced back and finally made some shots and relaxed a little bit,” Sun coach Mike Thibault said. Detroit wasted a vintage 27-point effort from guard Deanna Nolan, who hit 11 of her first 12 shots from the floor. “When she gets hot, she is spectacular,” Shock coach Laimbeer said. But the Shock didn’t get much else. Detroit’s starting backcourt of Swin Cash (2-11) and Katie Smith (1-9) were a combined 3-for-20. Center Ruth Riley had six points and three rebounds in 28 minutes. Cheryl Ford (15 points, 8 rebounds) was the only other player in double figures. Jamie Carey hit a key three-point shot with 2.7 seconds left in the second quarter to give the Sun a 39-38 lead at halftime. In the third quarter, Connecticut outscored Detroit, 17-5 to open the quarter capped off by Dydek putting the ball on the floor and driving to the basket for two points. Douglas drained a pair of jump shots that ignited the crowd while Dydek had six points in the run. Detroit fought back on the strength of Nolan, twice cutting the Sun lead to three. With 9:46 remaining in the game, Elaine Powell drove to the basket to chop the Sun lead to 60-57. After a Sun turnover, Riley missed an 11-footer. At the other end, Connecticut’s Ashja Jones put in a miss from McWilliams-Franklin. After a Shock foul, McWilliams-Franklin hit a 10-foot turnaround jumper to extend the lead to seven. The Shock cut the lead to three again when Nolan drained four-foot fadeaway jumper with 53 seconds to go. But McWilliams-Franklin banked a shot off glass with 31.4 seconds from the low post to extend the lead to five again. TIX AVAILABLE: There are plenty of tickets available for Game 3 of the Eastern Conference finals between Connecticut and Detroit at the Mohegan Sun Arena at 8 p.m. Tickets can be purchased by calling Ticketmaster at 877-WNBA-TIX or logging onto the Connecticutsun.com. Tickets are available for $8, $16, $29, $25, $30 and $50. DETROIT, Aug. 24 – Now, nothing will be able to wipe that grin off the face of Shock coach Bill Laimbeer. Detroit beat the Connecticut Sun for the fourth straight time this season with a dominant performance and a 70-59 victory over short-handed Connecticut to take a 1-0 lead in the best-of-3 Eastern Conference finals. The Shock ripped down a WNBA playoff record 48 rebounds and Cheryl Ford had a record 23 caroms. The Sun shot just 30.1 percent from the field and had a timid seven points in the second quarter and tepid 10 points in the fourth quarter. Detroit used a 20-2 surge to blow open the game in the fourth quarter. Connecticut played without leading scorer Katie Douglas, who has a hairline fracture in her right foot. But the Sun led by 12 at one point in the first half and led by 1 after three quarters. But Detroit’s rebounding was too much. The Sun limited Detroit to 37 percent shooting from the floor but Connecticut couldn’t muster up enough offense. Rookie Erin Phillips and guard Lindsay Whalen each had 13 points while Taj McWilliams-Franklin had 12. Margo Dydek scored 11 points. But Nykesha Sales managed just four points on 1-of-6 shooting and Ashja Jones had just two points after a 1-for-11 shooting performance. Game 2 is Saturday afternoon at the Mohegan Sun Arena and game 3, if necessary, is Sunday at 7 p.m.
UNCASVILLE, Conn., Aug. 21 – For the third straight year, the Sun are facing a key injury as they try to capture their first WNBA championship. Sun guard Katie Douglas is doubtful for the rest of the playoffs after being diagnosed with a hairline fracture in her right foot. Douglas was hurt in the final minute of Sunday’s 68-65 win over Washington. She won’t play in game 1 of the Eastern Conference semifinals against Detroit on Thursday. Douglas was hurt after she stole the ball from Washington’s Alana Beard. As Douglas went in for the layup, Beard knocked the ball away and Douglas landed awkwardly. Douglas, a MVP candidate, led the Sun in scoring with team-record 16.4 point average. She averaged 16.5 in the two games against Washington. A year ago, Sun guard Lindsay Whalen was hurt in the closing minutes of the Eastern Conference finals and was ineffective in the WNBA finals as the Sun lost to Sacramento. 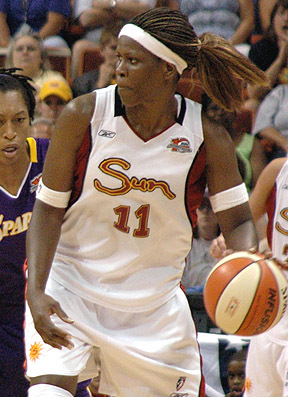 In 2004, key forward Wendy Palmer injured her right shoulder as the Sun lost to Seattle in the WNBA Finals. The Sun went 11-1 without All-Star Nykesha Sales in the lineup this year as Sales recovered from a sore Achilles tendon injury. Sales, who scored just one field goal in the Mystics series, will need to step up with Douglas’ absence. How serious is Douglas' injury? UNCASVILLE, Conn., Aug. 20 – It seemed improbable but Washington’s Alena Beard had a chance to extend the season for Mystics. Leading 1-0 in game two of the Eastern Conference semifinals, Connecticut was on the verge of ending the series with a 10-point lead with 2:23 left. Washington scored 12 of the next 16 points and had the ball with 7.6 seconds left trailing by three. But Beard missed with 5.1 seconds left and the Sun survived to sweep the Mystics, 68-65 and earn a shot in the Eastern Conference finals for the fourth straight year. The Sun will face Detroit in the Eastern Conference finals beginning Thursday in Detroit with game 2 in Uncasville on Saturday, Aug. 26. What was even scarier was All-Star guard Katie Douglas leaving the building on crutches. Douglas had a team-high 16 points but she hurt her right foot in the final 30 seconds of the game. She missed two games at the end of the year with cramps in her right leg. The pain was in the back of the foot, not her calf. “I just felt a sharp pain,” Douglas said. “I just felt like I was immobile out there.” She said the injury was in the area of the Achilles and the heel. It will be evaluated on Monday. Lindsay Whalen added 15 points for the Sun while Taj McWilliams-Franklin had 12 points and 14 rebounds. Washington (18-16, 0-2) trailed by six with with 20.2 seconds left when Beard hit a three-point shot from the top of the circle. When Connecticut tried to inbound the ball, Beard intercepted the pass from Taj McWilliams-Franklin and drove to the basket to cut the lead to one, 66-65 with 9.8 seconds to go. Beard fouled Whalen with 7.6 seconds left and Whalen sank two free throws for a three-point lead. On the inbounds, Crystal Robinson cleanly inbounded the ball to Beard, who had her chance but missed. Washington used a mixture of four defenses to slow down the Sun offense. It was the best defensive effort in Mystics’ playoff history. In the third quarter, the Mystics led by three before Connecticut seized control with a 12-2 surge sparked by 7-foot-2 Margo Dydek with six points. Her size influenced the Mystic offense, which briefly moved into a jump-shooting mode. Dydek finished with eight points and 11 rebounds. And the Sun forced 18 Mystic turnovers. UNCASVILLE, Aug. 20 – Sun coach Mike Thibault received his long-overdue honors as WNBA Coach of the Year Sunday. The ovation Thibault received prior to Sunday’s game 2 of the Eastern Conference semifinals with Washington was so loud that the public address announced couldn’t be heard. The Sun (26-8) had the league’s best record and they are in the Eastern Conference finals for the fourth straight year. WASHINGTON, Aug, 18 – The Sun limited Washington to 35.7 percent shooting as they took game 1 of the Eastern Conference semifinals with a 76-61 win over the Mystics. Lindsay Whalen had 14 of her game-high 22 points in the first half while Katie Douglas added 17. Taj McWilliams-Franklin had 10 points and 14 rebounds. The Sun limited Washington’s All-Star guard Alena Beard, who averaging 19.2 points, to just nine points. Connecticut led as much as 16 in the third quarter. “We did a great job in defending them,” Sun coach Mike Thibault said. Will injuries slow Sun in playoffs? UNCASVILLE, Aug. 15 -- The Sun (28-6) are in Myrtle Beach, S.C. getting ready for game 1 of the Eastern Conference semifinals with Washington on Friday night in Washington, D.C. as Connecticut looks to return to the conference finals for the fourth year in a row. Injuries to Lindsay Whalen spoiled Connecticut’s shot at winning a WNBA crown a year ago and the Sun have not been immune to injuries this season. All-Star Nykesha Sales missed 12 games with an Achilles tendon straight while All-Star MVP Katie Douglas missed the final two games of the regular season with muscle strain in her leg. Whalen didn’t play in the season finale against Detroit. “Katie did limited practice today,” Sun coach Mike Thibault said Tuesday. “We’re just trying to be cautious. She’s had some muscle cramping in our calf, and we’re just trying to be proactive by not overworking her this week. Nykesha has practiced full practices every day now for about 10 days, so she has not been an issue. Obviously, we rested Lindsey (Whalen) the other day, and that was more precautionary. She hasn’t had a break since… whenever. She hasn’t had one. I think by Friday everyone will be ready to go. We’ll be there ready to play." DETROIT, Aug. 13 – For the Sun, the game meant little. Seeing rival Detroit beat Connecticut for the third time this season, 88-65 wasn’t enjoyable as Deanna Nolan had a game-high 19 points and Katie Smith had 18. But the Sun (26-8) took solace that they remained healthy as the playoffs approach. Connecticut, looking to make their third straight appearance in the WNBA finals, is the No. 1 seed in the East and has home court advantage throughout the playoffs. The Sun face Washington in a best-of-3 Eastern Conference semifinal beginning Friday in Washington. For the second straight game, All-Star Katie Douglas sat out the game with a sore right calf and Lindsay Whalen joined her in street clothes Sunday. Taj McWilliams Franklin led Connecticut with 13 points while Erin Phillips added 12. The Sun cut a 20-point lead to six in the second quarter and trailed by just eight at halftime. But a 9-1 surge by Detroit (23-11) put the game out of reach. The Sun, who set a new WNBA record with 630 assists this year, immediately left for Myrtle Beach, S.C. for a three-day training camp before the playoffs begin. UNCASVILLE, Conn., Aug. 11 – After beating the defending WNBA champion Sacramento Monarchs a week ago, the Sun were asked if they look ahead and savor a chance for redemption in the league playoffs. After all, they have fallen in the WNBA finals for two years in a row. The Sun insisted they had work to do and games to play. But with a third straight Eastern Conference regular season title wrapped up and home court throughout the playoffs sewed up, Connecticut looked to just remain sharp. Nykesha Sales continued her comeback from an strained Achilles tendon that kept her off the floor for 12 games with a team-high 17 points while veteran Taj McWilliams-Franklin scored 12 to allow her to eclipse 3,000 points in her WNBA and ABL career. The Sun (26-7) played without All-Star guard Katie Douglas, who aggravated a calf injury on Wednesday night in her hometown of Indianapolis in a win over the Fever. A 9-1 run by Indiana broke open a tie game in the second quarter. Indiana allowed just 11 points in the fourth quarter. Tamika Whitmore scored nine points for Indiana, which shot 51 percent (36-for-71) from the field. SUN TO FACE MYSTICS: Connecticut will face Washington in its Eastern Conference semifinal beginning on Friday, Aug. 18 in Washington at 7 p.m. (NBA-TV). Game 2 will be Sunday, August 20 at 1:30 p.m. (ABC) at the Mohegan Sun Arena with game 3, if necessary on Tuesday, Aug. 22 at 7 p.m. (NBA-TV) … Veteran Taj McWilliams-Franklin was named WNBA Player of the Week for the second time this year and third time in her career earlier this week. She averaged 16.7 points, 10.7 points and two assists in three games last week. … The 87 points was the second-most Connecticut has allowed all year. … The Sun finished a league-best 14-3 at home and are a WNBA-best 12-4 on the road with the regular season finale Sunday at Detroit. UNCASVILLE, Conn., Aug. 3 – One of the traditional anthems that all athletes hear and try to ignore boomed down from the Mohegan Sun Arena rafters as a smiling Taj McWilliams Franklin signed jerseys, photos and programs for grateful fans after the Sun won a franchise-record ninth straight game with an impressive 72-63 win over the Los Angeles Sparks. It was Bruce Springsteen singing about Glory Days and those days of athletic glory gone by. McWilliams Franklin smiled and savored the moment. She tied her own season-high with 22 points and brought down nine rebounds. She and the Sun (23-6) hope their best days are ahead of them as they took another step toward securing the best record in the WNBA and home court advantage through the playoffs. The Sparks (23-8) seemed lost from the start, scoring just four points in a dismal first quarter and losing back-to-back games for the first time this year. All-Star Lisa Lesile had 18 points and a game-high 13 rebounds but received little help outside of Donneka Hodges-Lew (14 points). Connecticut’s Katie Douglas added 14 points while Ashja Jones came off the bench scoring four points but ripping down a team-high 10 rebounds. “I was most happy we had a lot of people involved that had an impact on the game,” Sun coach Mike Thibault said. Erin Phillips had five assists while Jamie Carey had a career-high nine points and a pair of 3-point goals. Connecticut won for the 10th time in 11 games since losing All-Star Nykesha Sales to a sore hip and Achilles tendon injury. The Sun limited the Sparks to 4 points on 2-of-16 shooting in the first quarter, setting new franchise records. Twice, Los Angeles crawled back within three in the second quarter but Phillips (4 points) hit a key jumper and Dydek hit a jumper in the lane off a nice feed from Douglas with 1:13 left. Douglas stole the ball 20 seconds later and Dydek finished off the possession with a 15-foot jumper. “I always preach that offense comes and goes but defense is everlasting,” Sparks coach Joe Byrant said. UNCASVILLE, Conn., July 28 – Defending WNBA champion Sacramento had trimmed a 17-point lead to four. But the Sun made sure the rally wouldn’t last with some key shots in the final four minutes to beat Sacramento 75-68 Friday night at the Mohegan Sun Arena. After Sacramento’s Nicole Powell drained a three-point shot to complete a 15-2 run and trim the Sun lead to four, wily veteran Taj McWilliams Franklin (15 points) slipped between two Monarch defenders with 3:21 left to extend the lead to six. With 2:55 left, Powell hit a jumper from the top of the key to again cut the lead to four but again it was McWilliams-Franklin with a one-handed shot between two defenders. Sun guard Lindsay Whalen iced the game when she drained a 25-foot three--point shot with 3 seconds left on the 24-second shot clock and 1:05 remaining to extend the lead to nine. The Sun won for the ninth time in the last 10 games and improved to 7-1 without All-Star Nykesha Sales, out with a sore hip and Achilles tendon. The only loss in that stretch was to Sacramento earlier this month. Connecticut’s Katie Douglas led all scorers with 19 points while Whalen added 17. Erin Buescher, who had a strong first half, had 13 points for the Monarchs while Powell led the way with 17 points, all in the second half. Yolanda Griffin, who had 21 points on 9-of-14 shooting in the 69-63 win over the Sun on July 15, had just six points on 3-of-7 shooting. The Monarchs starting backcourt of Ticha Penicheiro and Scholanda Dorrell were scoreless and a combined 0-4 from the floor. The Sun extended its Eastern Conference lead to 1.5 games over Detroit and remained in the race with Los Angeles (21-6) for the top record in the league and home court advantage throughout the WNBA playoffs. UNCASVILLE, Conn., July 8 – Connecticut’s Taj McWilliams Franklin limped off the court gingerly with 5:32 left in Saturday’s WNBA game with Phoenix before a sellout crowd at the Mohegan Sun Arena. Teammate Katie Douglas had missed on her drive to the basket but McWilliams Franklin grabbed in and sank it off the glass to give the Sun a three-point lead as the crowd exploded. It was that kind of effort that lifted the Sun (14-5) to a thrilling 82-77 win over Phoenix and Taurasi, the former UConn star who scored a game-high 25 points. Phoenix (7-10) led by as many as 19 points and held the Sun to just 9 points in the second quarter and 29 at halftime. , both season-lows. The Mercury, who throttled second-place Detroit by 15 on Thursday, forced 13 Sun turnovers in the first half. McWilliams Franklin had 17 points of her 21 points and 10 of her 12 rebounds in the second half while Ashja Jones came off the bench for 18 points, including 12 points and 11 rebounds in the second half. Katie Douglas led the Sun with 22. Connecticut outrebounded Phoenix, 28-21 in the second half and made just four turnovers. The Sun had 16 rebounds in the third quarter. Jones was outstanding going to the basket in the second half and had six points in a 12-3 Sun run that reduced a 13-point lead to one. Seldom-used Jamie Carey hit a crucial three-point shot and sparked the Sun with three rebounds, two assists and a steal. In the second half, the Sun were faster to the ball, especially on defense. Phoenix’s Cappy Poindexter, who scored a WNBA rookie record 35 points against Detroit on Thursday, was 0-for-7 from the floor in the second half and finished with just 10 points. Taurasi drove to the basket for a 73-70 lead with 3:21 to go. Douglas responded by going through two defenders and McWilliams-Franklin scored in the paint to give the Sun a one-point lead. Kamila Vodichkova gave Phoenix its final lead, 75-74,with 1:53 left as she drove past McWilliams-Franklin. But Douglas followed with a pair of foul shots and Whalen threw up a scoop shot as the 24-second shot clock expired to extend the lead to three, 78-75 with 53.8 seconds left. Taurasi cut the lead to one with a layup with 43.8 seconds left and after the Sun missed two shots, Phoenix’s Cappy Poindexter had a 12-foot jumper roll off the rim with 17.8 to go. McWilliams-Franklin grabbed the rebound, was fouled and sank two foul shots. Phoenix made just two of its final seven shots from the floor. STREAK OVER: The Sun played without All-Star Nykesha Sales, out with a sore Achilles tendon and hip. It ends a 271 consecutive games played streak, including playoffs. Sales has played in 248 regular season games, second longest in WNBA history behind Andrea Stinson (261). ALL-STAR PARTY: McWilliams-Franklin and Douglas were named to the WNBA Eastern Conference All-Star team as reserves Saturday making it the first time in league history that all five starters from one team will go. Sales, Whalen and center Margo Dydek were elected by the fans to start for the East, which has never won an All-Star game. Sales will skip the All-Star game, which will be held Wednesday, July 12, in New York City. UNCASVILLE, June 27 – It took just five minutes for the Sun to torch the Comets. Connecticut hit six of their first nine shots, forced five Comet turnovers and grabbed a 10-point lead as the Sun ran away from Houston, 73-57. In five losses on the road, the Comets (10-6) have lost by an average of 15 points. With 7-foot-2 Margo Dydek clogging up the middle with 10 points, 13 rebounds and three blocks, the Sun shut down the Comets’ top two scorers -- Tina Thompson and Sheryl Swoopes. Thompson, who came into the game averaging a team-high 18.3 points, was held to just two points on 1-of-12 shooting and four turnovers. Swoopes, who came in averaging 14.3 points, was held to nine on 4-of-15 shooting. "We missed shots we normally make with our eyes closed," Thompson said. "I know I did." The Comets had a season-high 71 shots but had a season-low 20 points at halftime and tied another season-low with just eight points in the first quarter. Houston had 20 turnovers. “You won’t win many games when you don’t make shots and you don’t play defense at the other end,” Swoopes said. Connecticut (11-4) was led by Nykesha Sales with 19 points while Katie Douglas added 15, including four 3-point shots. The Sun had four players in double figures. UNCASVILLE, Conn., June 22 – In the middle of a long road trip, the Sun enjoyed a brief stay at home with a 79-62 win over Minnesota. Connecticut, which was 1-2 in three road games in five days, fly to Chicago for a game Friday with the struggling expansion Sky. Ashja Jones had her first double-double in a Sun uniform with 13 points and 11 rebounds while Katie Douglas had 12 points. Margo Dydek and Lindsay Whalen each had 16 for the Sun. The Sun (9-3, 5-1 home) snapped a 40-40 tie with a 15-5 surge into the fourth quarter. The Sun ripped down a team record 50 rebounds. Nicole Ohlde had 16 points for the Lynx (5-7) while rookie Seimone Augustus, the No. 1 selection in April’s WNBA draft had 15 points, held in check by Douglas. UNCASVILLE, Conn., May 27 – The signs were everywhere at the Mohegan Sun Arena – hard picks that sent players to the floor, swarming defenses that surrounded shooters with two or three players and elbows to the jaw. Even though the WNBA season is only about a week old, there was a playoff intensity to Saturday afternoon’s game between Connecticut and Detroit. Connecticut erased a 14-point Shock lead and led by six with 1:44 left after a 3-pointer from Katie Douglas (18 points). But Detroit rallied and forced OT with when Katie Smith (game-high 23 points) hit a long 3-pointer with 1.3 seconds left to tie the game at 69. The Shock (2-1) prevailed in overtime, 77-73. Detroit scored the first six points in OT but the Sun (2-1) rallied to trim the deficit to two, 75-73 on a smooth shot by Douglas in the lane with 1:14 left. Ashja Jones turned the ball over on a charge with 44.8 seconds left and Douglas was double teamed on a shot with about six seconds left and the Shock grabbed the rebound to ice the game. Connecticut had its largest lead, 67-61, when McWilliams-Franklin kicked the ball back out to Douglas, who drained a 3-pointer with 1:45 left. But the Douglas and McWilliams-Franklin each missed key foul shots in the final 15 seconds that could have extended the Sun lead. Sun rookie Erin Phillips played the entire fourth quarter and OT in place of Lindsay Whalen, who is still recovering from off-season ankle surgery. Phillips hit a key jumper with 2:31 from the top of the key that gave the Sun a three-point lead, 64-61. Phillips had a key steal and outlet pass to Nykesha Sales (17 points), who scored a layup at the end of the third quarter for the Sun’s first lead of the game. UNCASVILLE, May 20 – The Sun raised their second straight championship banner Saturday before throttling its nearest rival New York, 91-74 on Saturday at the Mohegan Sun Arena. Players from the Sun smiled with pride as another Eastern Conference championship banner sailed into the rafters. But it’s the WNBA championship banner that they saw raised the night before in Sacramento that they really have their eye on. “When the banner went up, there was a sense of accomplishment and pride,” Connecticut’s Katie Douglas said. “But you can’t get complacent. You can’t expect to win (the Eastern Conference title) every year. We all watched Sacramento raise their banner. We saw the enormous championship rings. They earned it. But we watched, we saw it and we still have a lot to do.” Sacramento beat the Sun in the WNBA finals, 3-1 about nine months ago. Nykesha Sales had 19 points and tied a career-high with 10 rebounds as the Sun captured its first-ever season opener in Connecticut. Guard Lindsay Whalen played for the first time since offseason ankle surgery in January and had five points and five assists. Rookie guard Erin Phillips had eight points, two assists and two steals. Rookie Megan Mahoney sank 4-of-6 shots and scored nine points. Ashja Jones, who New York tried to sign to an offer sheet last winter, had 12 points. PHOENIX, May 13 – With the core of the two-time defending Eastern Conference champions finally together, the Sun won its first exhibition game Saturday night against the Mercury, 96-85. The Sun (1-2) received 30 points and nine steals from Nykesha Sales and 23 points from Katie Douglas. Lindsay Whalen did not play. The Sun open the regular season against New York on Saturday night, May 20, at the Mohegan Sun Arena. BANNER DAY, May 11 – The Sun will host a banner raising celebration prior to Saturday’s season opener against New York at the Mohegan Sun Arena. Doors to the arena will open at 6 p.m. and should be seated by 6:35 p.m. The raising of the 2006 Eastern Conference champion banner will begin prior to the 7 p.m. tipoff. All fans in attendance will receive a commemorative Eastern Conference championship mini banner. A fan festival will be held from 4-7 p.m. at the Mohegan Sun’s winter entrance. RADIO: The Sun will broadcast its team’s games this year New London radio station WXLM-FM (102.3). WXLM is a 3,000-watt station. Bob Heussler returns for his fourth year as play-by-play man for the Sun. Veteran Taj McWilliams-Franklin has been named WNBA Player of the Week twice this season.